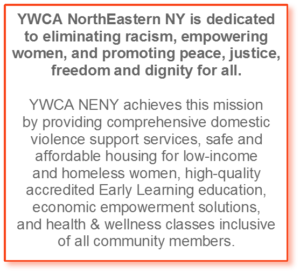 YWCA NorthEastern NY serves more than 6,000 families throughout the Capital Region by providing comprehensive domestic violence support services, economic empowerment programs, two accredited early learning centers, and safe and affordable housing for homeless and low-income women. Shelter – the only licensed domestic violence shelter in Schenectady County; offers a secure place for victims and their children that is staffed 24 hours/day, 7 days/week, 365 days/year. Advocacy – advocates located at Schenectady Police station, Family Court, and Child Protective Services. Counseling provides free and confidential individual and group counseling. Domestic Violence Holiday Assistance Program – provides women, men and children with gifts, wrapping paper, and household items that were generously donated from community members and organizations. The Housing Program provides safe housing and services for homeless and/or low-income women. Support services for the women include advocacy, counseling, support groups, information and referrals, health and recreation opportunities and an emergency food pantry and clothing closet. Single Room Occupancy (SRO) provides 55 housing units on-site for single homeless women. Rosa’s House Program provides 25 apartments in the community for single homeless women. Stepping Stones Program provides four apartments for women and their children in the community. The YES Program – The YWCA Economic Solutions Program is an economic empowerment initiative designed to assist domestic violence victims and homeless/formerly homeless women in obtaining employment, education, and financial stability. It provides life skills counseling, employment exploration, communication techniques, and stress and time management. The VITA/CA$H Program provides tax preparation and financial education services. Two Sites – located at Washington Ave & Schenectady County Community College, both offer full-day early learning. Developmentally appropriate curriculum: Each center utilizes the Creative Curriculum, a learning environment focusing on the emotional, physical and cognitive development of children from six weeks to five years old.